My goodness you guys. This cheesecake is outstanding. Easily one of the best I have ever tried and worthy of making for a special get together. While some cheesecake recipes can be fussy, this one is really simple. Two batters are made, one for the cheesecake and one for the carrot cake. They are layered in the pan and it bakes up easily, no water bath required. Many thanks to Sifting Focus for this recipe. Enjoy! 2. In the large bowl of an electric mixer, beat together cream cheese and 3/4 cup sugar until smooth. Beat in 1 tablespoon flour, 3 eggs and 1 teaspoon vanilla until smooth. Set aside. 3. For the carrot cake: In a large bowl, combine oil, 1 cup sugar, 2 eggs and 1 teaspoon vanilla, blending thoroughly. Stir in 1 cup flour, baking soda, cinnamon and pinch of salt, mixing well. Stir in drained pineapple, carrots, coconut and walnuts. 5.Bake in preheated 350˚F oven 50 to 65 minutes or until cake is set and cooked through. Cool to room temperature and then refrigerate. When cake is cold, prepare the frosting. 6. For the frosting: In a bowl of an electric mixer, combine 2 ounce cream cheese, butter, powdered sugar, 1/2 teaspoon vanilla, 1 tablespoon reserved pineapple juice and a dash of salt. Beat until smooth and of spreading consistency. Frost top of cheesecake. Refrigerate 3 to 4 hours before serving. Recipe from Sifting Focus. Sharing this recipe at the following fun link parties. My husband & son would drool looking at this recipe, could you imagine if I made it. Thanks for sharing Ali. This sounds amazing. I'm excited to be a new follower via GFC. Honestly, Ali, I'm going to have to start wearing a bib when I visit your blog before drooling on my keyboard shorts the thing out! I have never has the Cheesecake Factory's version, but this looks Amazing!! My husband would love this! Maybe I will make him this as a sweet treat this week:) Thanks so much for sharing! These look great. I am doing a link up on my blog and would love for you to come share this there. Wow, this looks so good, and would be perfect for Easter. My husband bought me a springform pan awhile ago, and this would be the perfect recipe to break it in with. Pinning this one! I'd sure love for you to share this on my Saturday Spotlight party this weekend too! I think I'm drooling just reading this recipe and seeing your wonderful pictures. I have to try this. Thank you for sharing at Marvelous Mondays! Drool... I need a bib! LOL! Pinned! Thanks for sharing at Two Cup Tuesday at Pint Sized Baker! Hope to see you there again on Monday night! I'm totally in LOVE! You're making me drool. You could BUT you would have to not use the entire cake because cake mixes make 9x13" pans of cake typically, and that would be way too much batter. So you would have to guess as to how much batter to use. My guess would be half? I've never heard of pineapple in carrot cake before, can you really taste the pineapple? will it mess it up bad if i leave it out? I don't think it would 'mess it up' but it would have less moisture in it for sure. I adore your blog! I love how you take your pictures and really show what a reader would like to see. 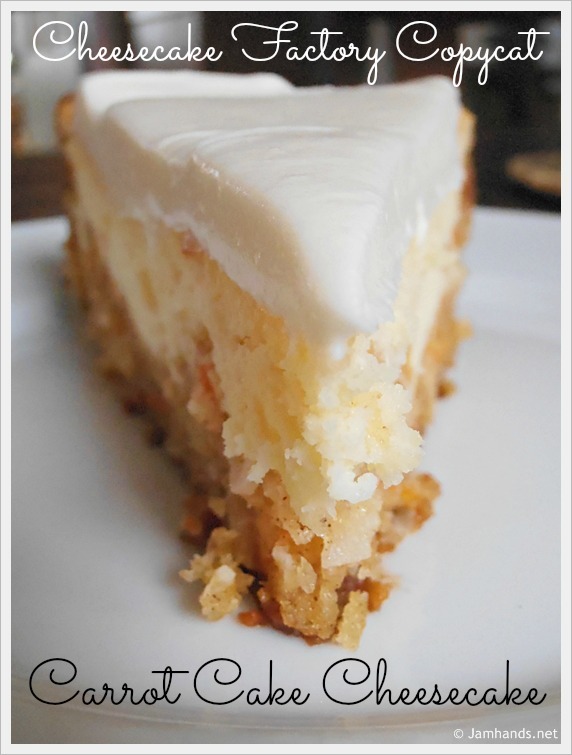 For example with this cheesecake recipe, how'd you know I'd need to see a shot of the layers close-up? :-) Thank you for all you do and keep up the awesome work! You confused all my senses w this cake!! :)) can not wait to try it..
Now I know what I'll make for my husbands birthday! Thanks! Can you please clarify step 4? It sounds as if you are layering the carrot batter, cheese cake batter, then carrot batter again. However the picture shows the carrot cake under and coming up behind like a crust. Sorry if this is a weird question, I've never tried to make anything like this. Yep that is exactly what you do. There is a thin layer of carrot cake that is mixed in with the cream cheese layers, but it is hard to tell from the picture. Possibly, I haven't tried it though. I am going to make this, but instead of carrot cake, I'm going to make a chocolate turtle cheesecake cake! Using (half) of my favorite cake recipe, with your cheesecake recipe, then caramel and pecans on top. My question to you is, the carrot cake is very dense, and I'm assuming heavier than the cheesecake, and that's why it stays where it is suppose to. But if I do a regular cake batter, do you think the layers will swap since a regular cake batter is less dense than the cheesecake?? My wife made this today and it was a TOTAL HIT! Everyone enjoyed it and we had to look-up the recipe. Highly recommended. Making this right now. hope it turns out as picture perfect as yours! I made this over the weekend. It was easier than I thought and really good. The flavors of the cake and cheesecake balance well. I'm putting it on the Christmas table this year! Thanks! Hi, I was wondering if this could be made a day ahead and kept in the fridge? Thanks! If I wanted to make these into bars and use a large square pan, how would that change the cooking time and duration? Jasmine - I've never made them like that so I have no idea, lol. I would suggest googling recipes for cheesecake bars and using your best judgement on time. Baking soda not baking powder? Oh my, never tried a carrot cake before but look delicious! I've made this and it is outstanding!!!!! Thank you so much for this recipe!! I made this for a work luncheon. It was a hit. This cheesecake was the best cheesecake I’ve ever made. We liked it as much as the Craig’s Cheesecake from the Cheesecake Factory, if not more! Thanks so much for the recipe! Can you clarify the ingredients/step 2? In the ingredients list for the cheesecake it has 1 tsp. vanilla, however the instructions in step 2 say to add 2 tsp of vanilla. Thank you! That is a typo. It should read 1 tsp. in step number two. Thank you for letting me know, I'll fix the recipe now.